I’m getting really good at cutting my losses. First, the husband. Divorcing him was the best decision I ever made. But between single-parenting and job-hunting, I can’t catch my breath. When a celebrity blogging position falls into my lap, I’m determined to succeed. That is, until I get my first assignment and actually see Noah Frazier for the first time . . . practically naked and dripping wet. My heart races and I forget how to form complete sentences. His chiseled abs, irresistible smirk, and crystal blue eyes are too perfect to be real. So, what do I do? Get drunk and humiliate myself, of course. I’m ready to forget the awkward night, yet Noah has no intention of allowing me to move on. Instead, he arranges for me to write a feature on him, ensuring a lot more time together. One embarrassing moment after another, one kiss after another, and before I can stop myself, I realize—I’m falling in love with him. But when the unthinkable happens, can I even blame him for cutting his losses? What I wouldn’t give for just one last time . 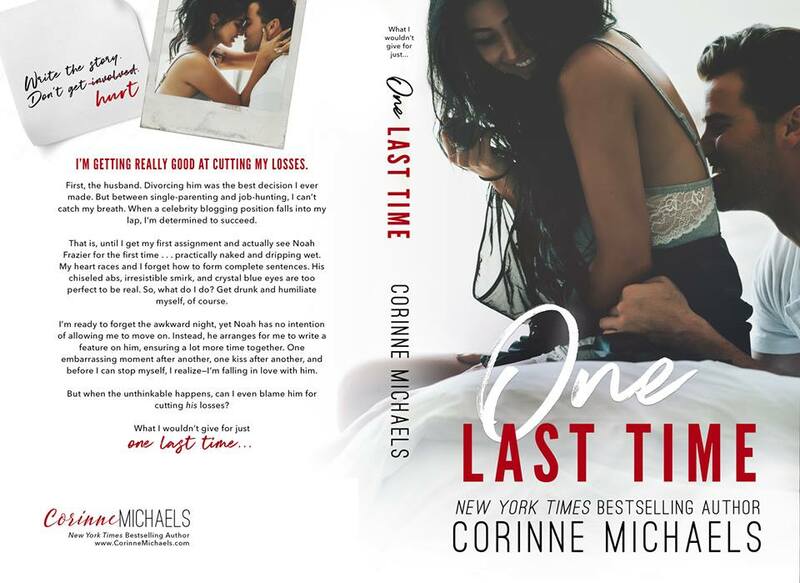 . .
Meet Corinne: New York Times, USA Today, and Wall Street Journal Bestseller Corinne Michaels is the author of nine romance novels. She’s an emotional, witty, sarcastic, and fun loving mom of two beautiful children. Corinne is happily married to the man of her dreams and is a former Navy wife.